Saxon & Norman Colton - 1066 and all that! The first written account of Colton is in the Domesday Book. This was the great survey carried out by William the Conqueror in 1086 to record what he had actually acquired when he had become King of England after the Battle of Hastings. Although the intention was to record the new ownership of the land holdings, it in fact also gives us a record of what was already there in Saxon times and who owned what before conquest. 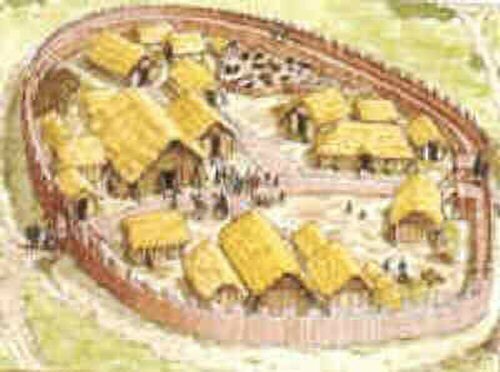 Possibly what the settlement of Colton looked like at the time of the Conquest. The entry for Colton appears twice in the Domesday Book... Part of the village was given by King William to Earl Roger of Montgomery , Earl of Shrewsbury and the other part to Robert of Stafford; two great Norman barons who had greatly assisted him in the conquest of England. They did not live in Colton but let the village to Azeline and Geoffrey of Gastenois, two Norman knights. The knights had to serve the barons whenever they were needed. The first entry under the land holdings of Earl Roger in Pirehill Hundred . This he lets to Azeline. The entry shows that a Saxon called Almund who had been a freeman or land owner, had held this land previously in the time of King Edward the Confessor and had had his land confiscated by King William. There is enough land for four ploughs. The plough land estimated the arable capacity that an eight ox plough team was needed to work it. 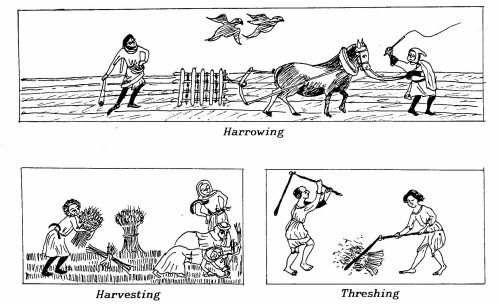 The lord has two ploughs and also 4 serfs to work the land. Also part of this holding is Little Hay which in Saxon times is held by Almar and then on Earl Roger’s acquisition of the land is also let to Azeline. The second entry is under the land holdings of Robert of Stafford again in Pirehill Hundred. (Ref. Domesday Staffordshire 249a). Here the entry shows that in the reign of Edward the Confessor it was held by two Saxon freemen (landowners) called Oda and Wulfric. Robert lets it to Geoffrey . There is enough arable land in this part of the village to need six ploughs to work it. Geoffrey owns one plough and the 10 villeins and one slave work three ploughs. Here there is also a mill that pays 12 pence rent a year. There is 16 acres of meadow for grazing the animals and woodland 1 league long by 3 furlongs wide, 1 mile by ¼ mile. The value of this part of the village is 50 shillings. If at the time Domesday was compiled there were five people in each of the families of the villains and serfs, there would be roughly a hundred and forty five people living in Colton as a whole with a total value of 90 shillings which compared to the other villages around Colton, made it the biggest and most valuable village between Stafford and Lichfield. The daily work of the villagers remained unchanged by the coming of the Norman. The Villeins had their own land to farm and had to work on the Lord’s land about one day a week and rather more at harvest time. This was in return for having their own land. The serfs had no land of their own and had to work for the lord. They were entirely dependent upon him and could not leave. Around the village there were usually three large fields, one ploughed and sown in autumn with wheat, one ploughed and sown in spring with oats or barley and one left fallow with no crop at all. The animals would be turned out on this to graze it and manure it ready for the next season. These fields were ploughed in strips by the Ox teams. Turning the 8 ox team around at the end of the strip meant that there would be a curve at each end giving it the shape of an s. If you look at an ordinance survey map of Colton you can still see that some of the field boundaries have this shape even today and until very recently the ridges and furrows of these strips could still be observed on one of the fields in Colton. Unfortunately they have now been ploughed out. We do not know all the parts of Colton included in these fields other than a few clues in ancient deeds that mention strips in Hamley field, Parch Field, Trent Field and a field close to the road near where the mill was. The mill at this time was at the crossing of the River Trent that divided Colton from Rugeley and was driven by water. It was an important asset to acquire. The rest of Colton would be meadows for feeding the animals, woods that provided timber for the lord and beech mast and acorns for the animals of the village as long as the Lord was paid. Colton Staffordshire County Council Education Dept. Local History Source Book L49.